What is your working title of your story? “Tips for a Smooth Transition.” The story first appeared in an issue of Salamander, a great literary magazine out of Suffolk University, MA. It’s been included in the anthology, FIRE AND FORGET, which will be released in February, 2013. Where did the idea come from for the story? When I started writing my story collection, You Know When the Men Are Gone, back in 2007, I felt like there was so much about military life and deployments that readers didn’t hear about in the news. Things have changed somewhat in the past few years, some great memoirs and novels have come out about both the soldiers’ experiences in theater as well as the family experiences on the home front (Laura Harrington’s Alice Bliss, Alison Buckholtz’s Standing By). And, as the years go by, there has been a greater scrutiny about how deployments affect both soldiers and their families. In “Tips for a Smooth Transition,” the protagonist, Evie, is almost too aware of what her husband may have gone through in Afghanistan, and she expects him to return to her damaged to some degree. So she watches him with a critical eye, expecting his reactions to be tinged with PTSD. She also feels guilty about her behavior while he was gone. I want the reader to wonder who is more unhinged by the deployment/marital separation: the guilt-ridden wife or the returning soldier? Who can the reader trust? What genre does the anthology fall under? Oh, fun. The spouse, Evie, could be played by Rachel Weisz. I think she is a tremendous actress, and she could perfectly express Evie’s emotional ambiguity toward her husband. The husband, Colin, could be played by Alexander Skarsgard. Don’t tell my husband, but I developed a serious crush on Alexander Skarsgard after watching him play Sergeant Brad Colbert in HBO’s Generation Kill. I’ve seen him in other roles, but, oh boy, the guy makes a great Marine/soldier. The interloper, John, could be played by Matthew McConaughey, he’s so smooth, can do a great Texas accent, and could nail a slightly slimy character who would pursue a woman whose husband is deployed. What is the one-sentence synopsis of your story? Evie welcomes her husband, Colin, home from his deployment to Afghanistan, unsure if their difficultly reconnecting is due to his long absence or if he has somehow found out about a dalliance she had while he was gone. Will the anthology be self-published or represented by an agency? The book is represented by E.J. McCarthy, and it’s being published in paperback by DeCapo Press in February. It took me a few years to write/rewrite the failed novel that the story is based on, and about a month to write the short story. It was a relief to turn all of that material into something I could use. I may go back the novel someday, who knows, but I loved being able to find a way to recycle some of the scenes that resonated with me the most. What other books would you compare this anthology to? Jeffrey Hess edited a powerful collection in 2009, Home of the Brave: Stories in Uniform, which is full of both iconic and lesser known war stories. 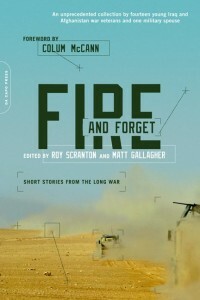 Fire and Forget has a few names readers might recognize, like the lauded writers David Abrams (author of Fobbit) and Matt Gallagher (author of Kaboom!). Many of the other authors are newer to the writing scene. As recent members of the armed forces, they bring a freshness and urgency to the fiction about our current wars in Iraq and Afghanistan. Friend Matt Gallagher, who is one of the editors of Fire and Forget, asked me to contribute. Other than myself, all of the stories are written by military veterans. Matt was giving me an opportunity to be the one civilian/family member in the mix. Unfortunately, I didn’t have a story at the time, but I did have a novel-in-progress hanging around rather uselessly. Matt gave me a month to get a story to him, and I managed to cut the 300 page novel down to 30 pages. Fellow anthology editor, Roy Scranton, gave it a sharp-eyed edit that also helped trim the story down to the final anthologized version. The story is very different than the novel draft, but the characters and some of the situations (a supposedly romantic trip to Hawaii to celebrate the husband’s return) are the same. What else might pique the reader’s interest? 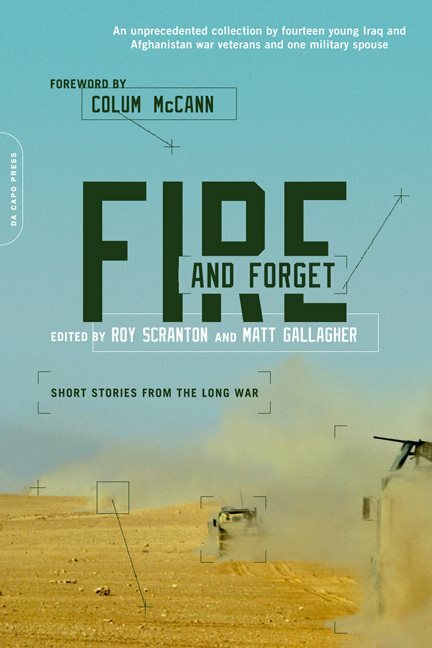 E.L. Doctorow referred to the anthology as: “Searing stories from the war zones of Afghanistan, Iraq, and the USA by warrior writers, Fire and Forget is about not forgetting. It is a necessary collection, necessary to write, necessary to read.” And we are taking the show on the road. I’ll be doing events in DC, NYC, and Boston with some of the other writers. Please check out the website, http://www.fireandforgetbook.com/, for reviews and other details about this exciting new release!